This year’s West Virginia High School Business Plan Competition is open for entries until Dec. 7. 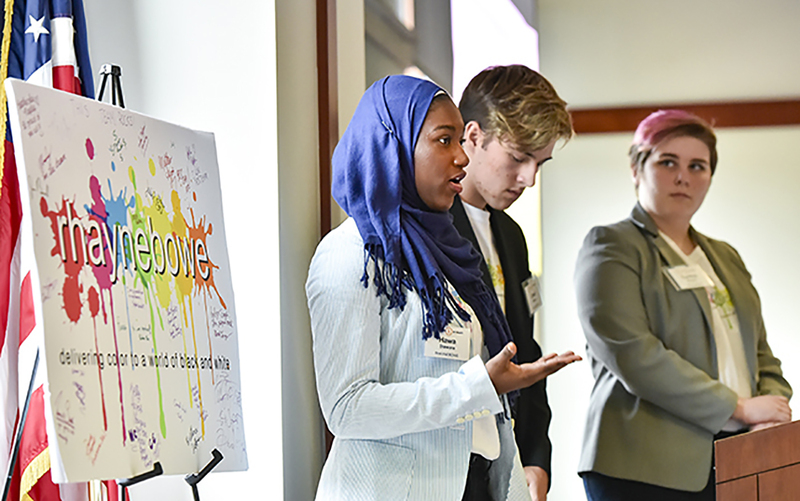 Pictured here pitching their business idea in last year’s competition are, from left, Hawa Diawara, Morgantown High School; Creed Kidney, John Marshall High School; and Cynthia Murphy, Gilmer County High School. While the team members are from different schools, they met previously at West Virginia’s Governor’s School for Entrepreneurship. MORGANTOWN, W.Va. — A college scholarship worth $10,000 is up for grabs in a competition for West Virginia high school juniors and seniors who have a great idea for a business and a plan for success. The Sixth Annual West Virginia High School Business Plan Competition is open to all juniors and seniors at public and private high schools and technical centers in the state. Co-hosted by the West Virginia University College of Business and Economics and the West Virginia Department of Education, the deadline for entries is at noon Dec. 7. Last year’s High School Business Plan Competition winner was Cheyenne Pawlus, then a junior at the Fayette Institute of Technology in Oak Hill. Teams may be comprised of one-to-three people, with the winning team dividing the scholarship among all team members. The scholarship may be used at any of the West Virginia colleges or universities participating in the competition, including Bethany College, Bluefield State College, Concord University, Fairmont State University, Glenville State College, Ohio Valley University, University of Charleston, West Liberty University, Wheeling Jesuit University and West Virginia University. Entries must be submitted electronically using the West Virginia High School Business Plan Competition entry form found on the competition website. After judges evaluate the entries, 10 teams will advance to the final competition. Finalists will be announced by Dec. 21. and the teams will work on their business ideas for the months to follow. The winning team will be announced on April 12, 2019, when finalists from the West Virginia Statewide Collegiate Business Plan Competition and the high school competition will work in their respective areas of the Robert H. Mollohan Research Center at the I-79 Technology Park in Fairmont. The BrickStreet Center for Innovation and Entrepreneurship is part of the WVU Innovation, Design and Entrepreneurship Applied Ecosystem, a university-wide network of centers, offices and programs that fosters and supports innovation and entrepreneurship among WVU students, faculty and staff while engaging the statewide community. Other areas include IDEA Faculty Fellows, WVU Women’s Business Center, LaunchLab Network Davis Young Innovators program, WVU Extension Service, Patent and Trademark Resource Center, Health Sciences Innovation Center, Legal Clinics, Media Innovation Center, Manufacturing Extension Partnership, the MakerLab and Technology Transfer.